For a recycled bag it doesn't have a cheap feel to it.. Seems very durable and high quality, I think my customers will be impressed with the new bags. Great experience working with this company. We ordered our bags on a rush order and the quality was perfect. The imprint looked vibrant and crisp. I work as a realtor in my city and my wife works for as a florist so naturally she has been on the "green living" kick for some time.. My wife suggested using custom earth promos for some promotional products at some of my open houses to promote the company, and the feedback has been great. 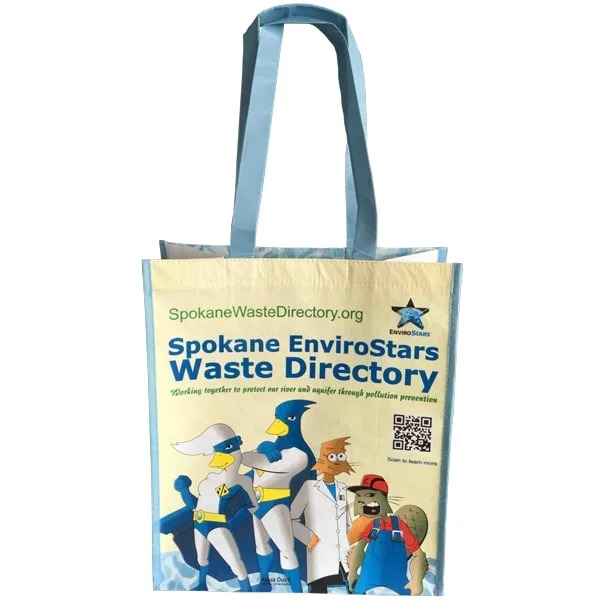 We have had an increase in sales and activity sense using the bags and other promotional products from custom earth promos. I definitely would recommend using this company for all your promotional marketing needs. Perfect is you need a full custom bag. We add the inside lamination for an additional charge. Our customers rave about these bags. 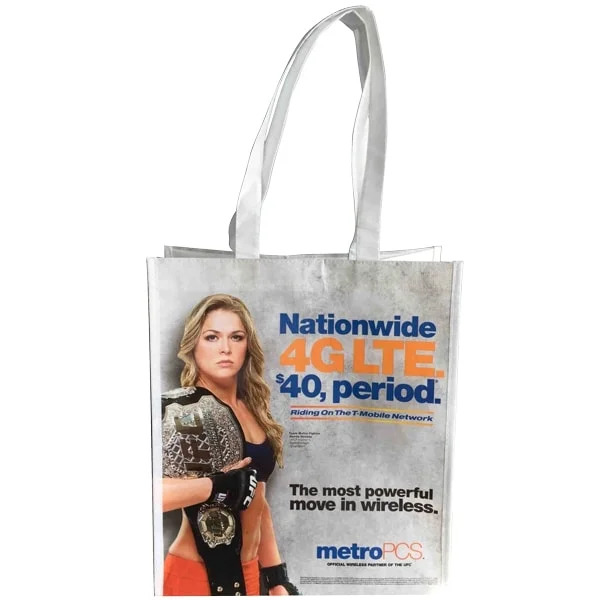 We purchase this full color bag in bulk and always receive a great price. We always take advantage of the full color edge to edge design. Customer service is always outstanding. I received a sample of this bag after seeing it at other nearby businesses. 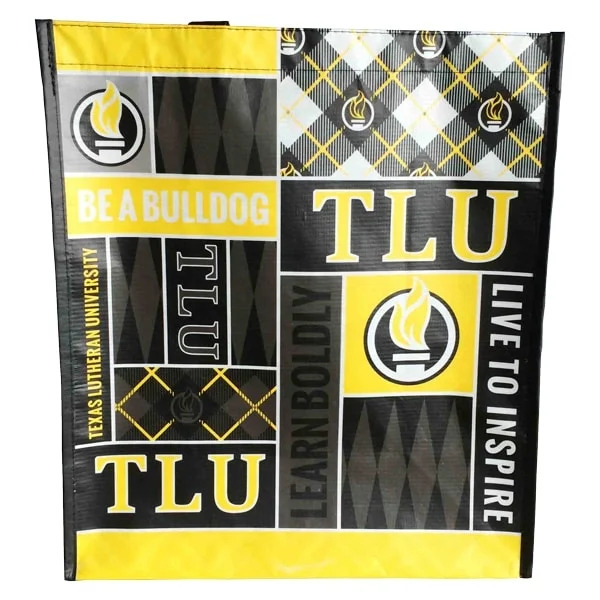 The quality is fantastic and I love that you can customize it however you want and it is made with recycled bottles. It is definitely something we plan on making a bulk order of in the near future. 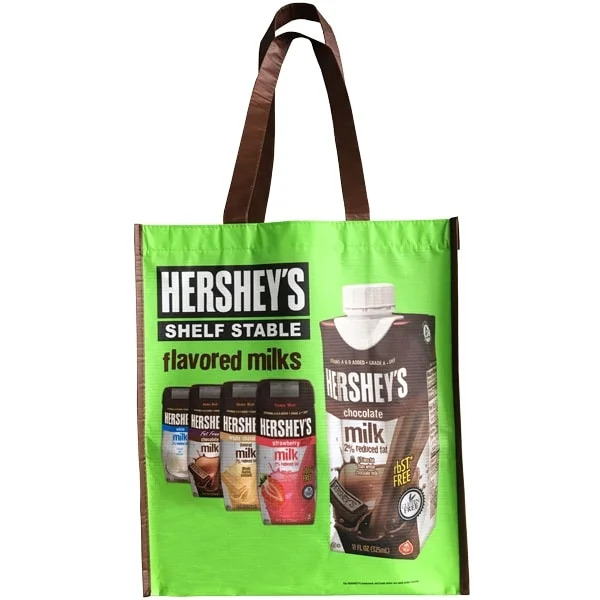 The glossy finish available with this eco-friendly shopping bag gives it a great look. Our logo stands out and these factors should really help us market ourselves better. 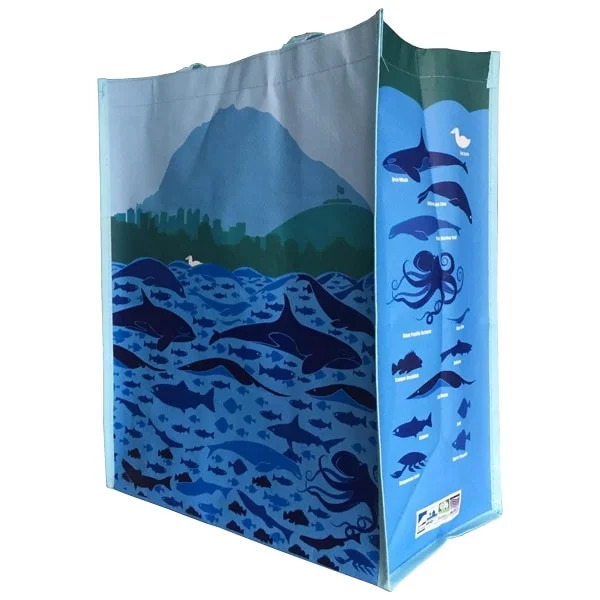 My local grocery sells these bags which I love and I see that they are easily washable. I really like the full color imprint and custom trim and handles. They are also made from recycled water bottles which is so nice. Super cute bag! I use it for all of my grocery shopping! I am a Mother of 5 and use these bags for everything.. I first got introduced thru my local grocery store and now I have my retail store using them.. I love eco-friendly products and it doesn't get better then 100% recycled bags. I recommend custom earth promos to everyone! I work in the retail sector and recently purchased recyclable bags from Custom earth promos. Feedback from customers has been great and we love that we are playing a part in saving the environment. These bags have been such a popular item at all our conventions. I know they have really played a huge part in the increase in my sales. It makes their grocery trips much easier and this helps the earth. We placed an order for 7,000 RB4 shopping bags. We got a great discount on them. Each bag was consistent in its high quality. Awesome bag, full prints and very durable. I highly recommend using this bag for your groceries AND YOU WILL SAVE THE EARTH IN THE PROCESS. This bag is awesome! Totally customizable. Thanks CEP! Hi i am writing this review to test whether it is a browser or technical issue. THe issue doesn't comes every now and then but i think this may be due to the IP switcher tool HMA. We will deeply test this today with the help of our tester. The handles are double stitched and reinforced this reason enough to purchase the bag. Our last supplier didn't do this and the handles ripped off in time.. I work in marketing and branding, about 10 years ago my company made a shift to start living and producing more eco-friendly products. We actually incorporated recyclable reusable bags into the "packaging" of most of our products. Being that it is reusable and very durable (at least we found that custom earth promos bags are) we looked at how we can use the bag to package our product. We since have had a long standing relationship with custom earth promos, they are a delight to work with and stand for a great cause. Attractive eco-friendly bags that are efficient and cost effective. I love the customizable handle length option on these bags! They are the perfect for for my business! I have re-used this bag for a while now and it is holding up so well! I am constantly getting compliments at the grocery store, and also thoroughly enjoyed working with this companies sales rep, Danielle. So excited about our bags! CEP really went above and beyond! We got our bag order and we are so happy that we chose this company! The sales team was so helpful during this process. Even the designers helped us promote our logo the right way on the bag. I just can't get over how great they look! We just got our order and the bags came out amazing! We had to have a specific size and handle color, and we were able to customize the whole bag. Very happy we went with this company! I LOVE that these bags are actually made out of recycled water bottles! The team did a great job helping me design the bag with our company logo. I was so happy when we got the order, I will definitely be placing another one soon! I really appreciate the quality of these bags. They are extremely durable yet still lightweight. Everyone at my event was thrilled with the bag. I was a bit nervous because I had such a complex logo, but the graphic designer really came through. I never post reviews but I had to for my experience with CEP. They made the whole process so easy, and seemed to really care about getting everything right. We ordered this bag for a conference and could not be more pleased with the outcome! There is so much space for my logo on these bags! I couldn't be happier! So pleased with the way our bags turned out! We added the zippers to our bag and it was a huge hit with our clients! We love them as well! Easily washable, I use them for my sons sports equipment.. Very sturdy and durable. We got them from a friends wedding as a gift bag. Custom Earth Promos offers alot of bags I selected this one because it was the perfect size and the laminated finish. I figured it was perfect for grocery store runs which is what we do. I’m giving them five stars for a reason. Haven’t found a better company out there for promotional products. This bag is awesome! Huge success at our tradeshow! All of the other tables offered pens and 8.5" x 11" handouts, key chains and other items that will end up at the bottom of someone's drawer. Our bags however will go on and live for years!!! Thanks Custom Earth Promos!! 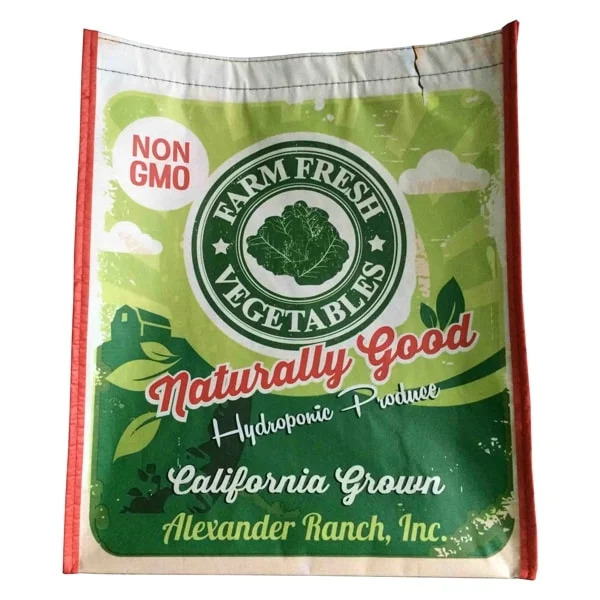 We needed a VERY large quantity of bags and it was great that we could use Custom Earth Promos for a wholesale factory direct purchase to make the price affordable. Customer service was great and we received the bags on schedule within our company's budget. I would use this company again. Took a big chance and got a big reward. Currently eyeing some water bottles so get ready for another big order! Love the glossy finish really makes my company's logo design stand out. Plus it shows that my company cares about the environment by using recycled bags. It was hard to determine which bag I wanted with so many choices, but I think this was the perfect choice. Was a bit nervous as I’ve had events ruined by products that didn’t come on time. My bags arrived ahead of schedule and I couldn’t be happier. Just received our order and are ecstatic about the finished product. Working with Custom Earth Promos has been very easy and worthwhile. They've found a customer for life. I have gotten burned so many times ordering bags for other site I was kind of expecting the worst when I placed my order. Cannot express how happy I was to get the bags on time and as I specified. Most companies don't let you place such a small order, and I wanted to start small since this was my first time using promotional products. I was so impressed I have already placed my second order! This company rocks! We all need to use recycled bags! I will highly recommend this company! Great bags, my customers are really happy with them. It makes their grocery trips much easier and this helps the earth. Win win in our book. The laminated print on the bag is impeccable and vibrant, the stitching quality and how the bag was fabricated seems to be top notch for a affordable recycled bag. 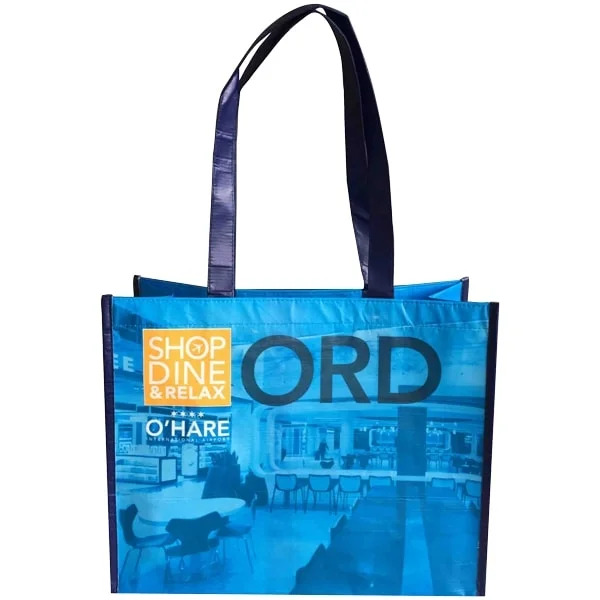 Our eye-catching Custom Recycled Shopping Bags are the perfect product to promote your brand in an eco-conscious way. 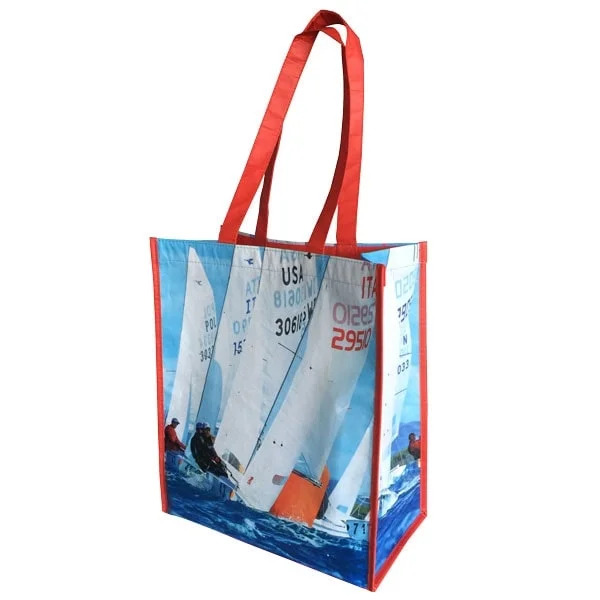 Can you imagine how great your custom logo would look imprinted on our high-quality bags? Your customers will love carrying them, and you can feel proud knowing your brand is getting the visibility it deserves, while also earning eco-friendly credentials among the masses. 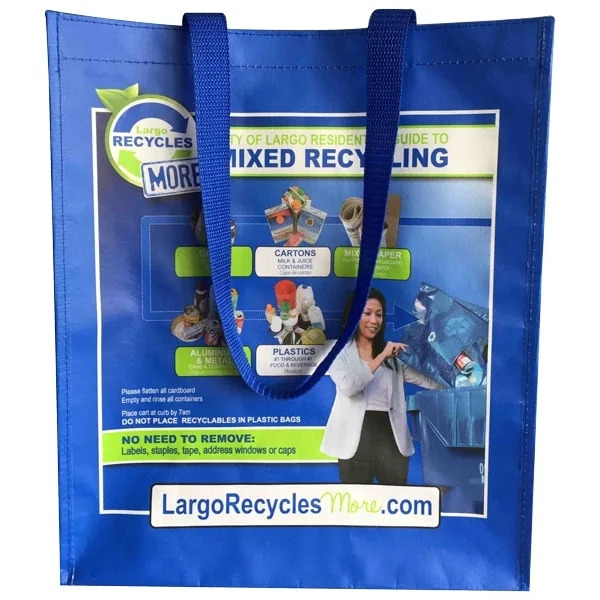 If stylish, environmentally conscious promotional bags are a priority for your business, our amply sized recycled carrier is your best bet. 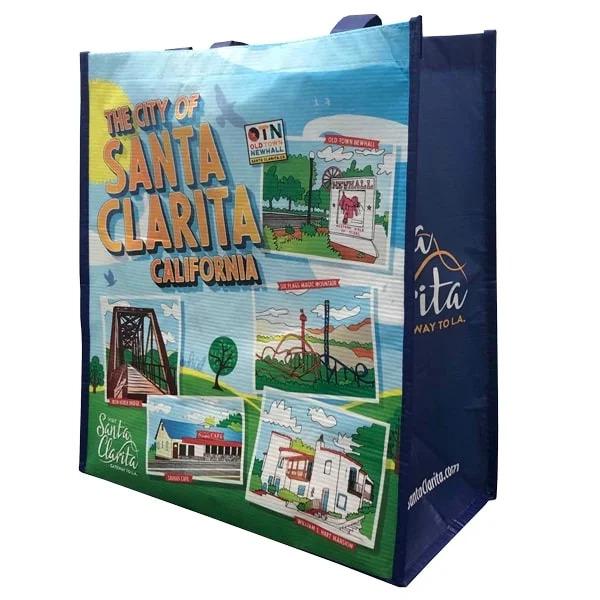 Boasting an attractive glossy finish, Custom Recycled Shopping Bags from Custom Earth Promos are head-turners that keep the attention firmly on your custom design, logo and brand name. Available in different sizes, designs and colors, our bags match solutions to needs perfectly. Offering a vast canvas for full-color printing, they also offer a strong visual appeal and the eco-merit to go along with it. 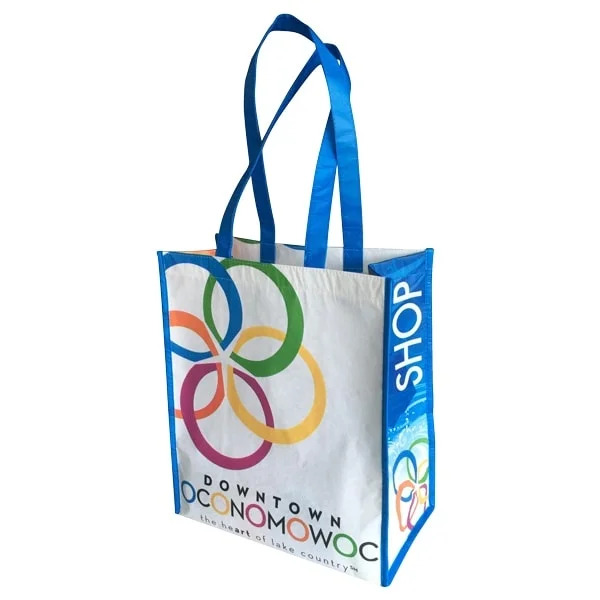 Visually appealing and eco-friendly, our glossy bags make popular promotional items that serve functional benefits while also spreading the green message. 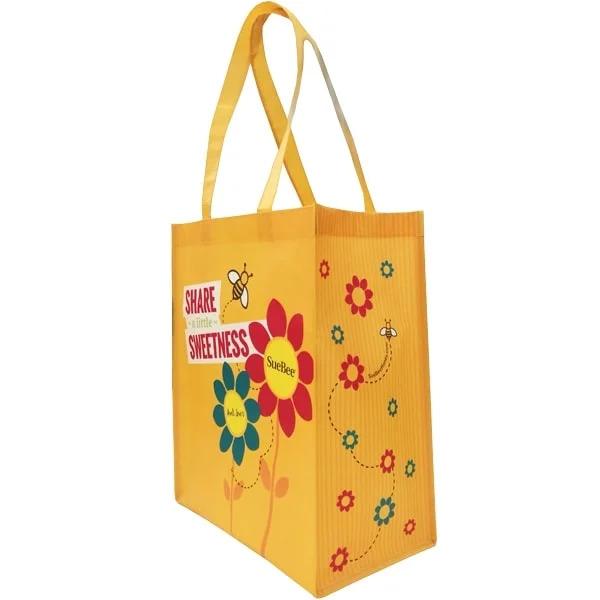 So make every customer sit up and take notice of your thoughtful choice, as you enhance your brand reputation the instant you select this attractive tote. 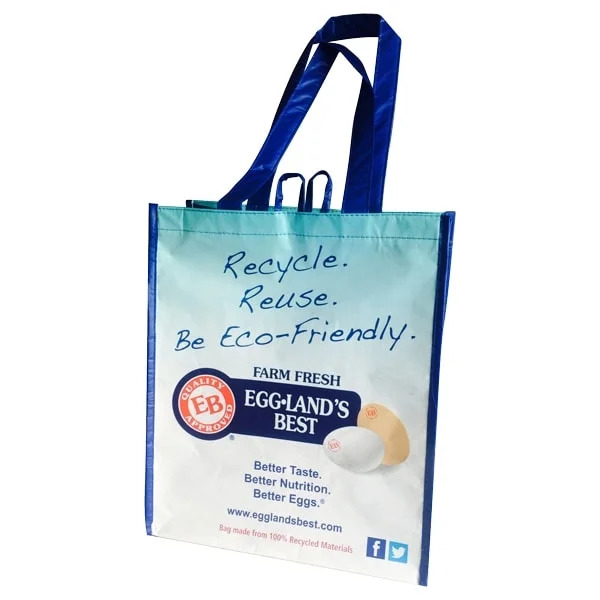 Custom Earth Promos prides itself on its range of eco-chic reusable bags, which are fast becoming the preferred choice of businesses that want to show customers that they care. This means no cheap, low-quality bags that come apart at the seams, or a hurriedly designed custom logo that fades over time. Our bags are made from recycled plastic bottles (rPET) and are quietly resilient to the wear and tear experienced during the course of countless shopping mall trips and daily hauling duties. Recycled PET offers a slew of environmental benefits. The EPA (Environmental Protection Agency) estimates that two-thirds less energy is needed to manufacture products made from recyclable plastic. And studies have also shown that recycled plastic production requires 50% less nitrous oxide, 60% less sulfur dioxide and close to 90% less water usage. 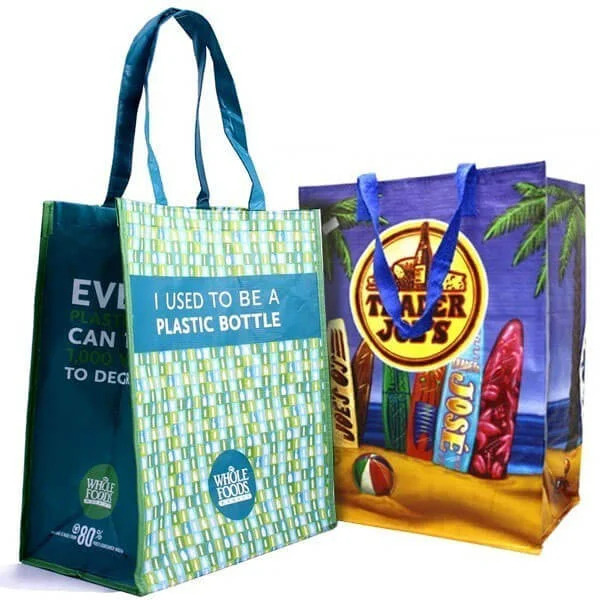 So when you invest in Custom Earth Promos' Custom Recycled Shopping Bags, you are inspiring your customers to think eco-consciously while supporting your promotional goals. 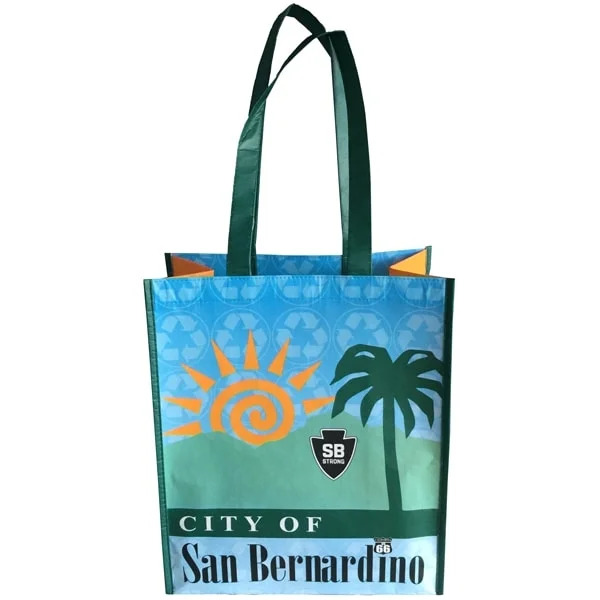 Our tailored solutions mean you can order your Custom Recycled Shopping Bags exactly the way you want them. The only feature that remains consistent across all bags is the eye-catching glossy finish. The rest can be modified according to your preference. This means: multiple choices in handles—from a more traditional carry handle to over-the-shoulder handles or convenient drawstrings, all made from rPET; bags in different dimensions (H x W x D); attractive bags in an array of colors; zipped or open bags; ample print coverage and a base gusset, and your logo or design, just the way you want it. Our wholesale, factory-direct products are available at surprisingly low prices. The cost savings we realize with our overseas production, we pass on to you! Promoting your brand and eco-message has never been so cost-effective. So rely on Custom Earth Promos’ talented design team and meticulous production managers to take care of your custom promotional requirements every time.